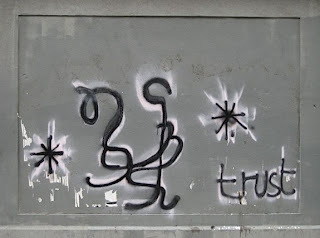 Here's one of my favorite graffiti taggers once again, the one I call "3E." And on the center column there's the outline of a surprised looking cat. 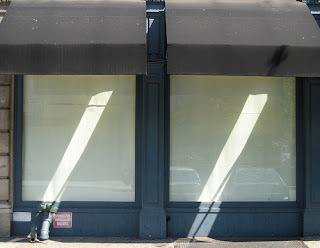 I've posted all these tags before, here, here and here, but not accompanied by such nice lines and shadows. I called the plumber yesterday and presented him with a perfectly reasonable argument for why I should not have to pay his outlandish fee. He seemed rather unmoved, though he did promise to get back to me. Meanwhile, I've gotten used to the idea that maybe this is just what plumbers cost, and I might have to cough it up. Ugh. My brother's poor old dog, Utah, who I mentioned here, died last Friday. My brother has been really broken up about it, as you'd expect. He and I talked on Sunday, comparing notes on loss - I lost a beloved pet in 2005, my 16-year-old cat Howard, so I told him about the stages I went through and the feelings I had then. I think it helped him see that his feelings aren't unusual. He described himself rather poetically as a planet that has lost its moon. So I got the bill for my recent adventure with the plumber. For installing a new kitchen faucet and fixing a minor glitch in the flushing mechanism of my toilet, the bill came to - drumroll please - $443.11. They're trying to bill me $157 for parts alone, which is interesting, because the faucet they installed is available for $62 at the hardware store across the street. And what they did to my toilet was so minor it's hardly worth mentioning. They're also trying to bill me for the time they spent driving around town to buy a faucet that they said they'd bring with them (and that's available at a retail store about 100 yards from my front door). So, as anticipated, the adventure has not concluded. I'm going to call them this morning and explain to them why I am not paying that much. We'll see how it goes. I really long for the mythical day when you could call a service person and that person would come and do an honest job and charge an honest amount. 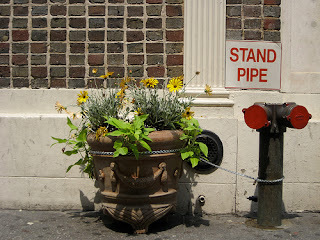 This cracked me up - a cheerful spring planting that has to be chained to the standpipe. 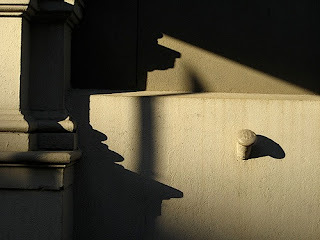 It's the intrusion of the practical on the aesthetic. And it's so New York. Had another busy day yesterday. I spent the morning reading and doing computer stuff, and then went to Dumbo in Brooklyn for the afternoon. Dumbo is actually an acronym that stands for Down Under the Manhattan Bridge Overpass. 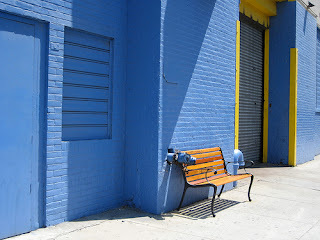 It's a waterfront neighborhood that's somewhat similar to nearby Williamsburg - once popular with artists, it's now gentrifying, but there's still lots of interesting street scenery. I went to a bookstore/art gallery and had some coffee at a local cafe, and of course took more pictures, which at this rate I'll get around to posting in a few weeks! 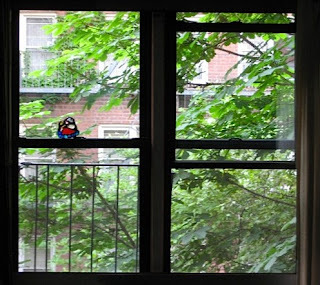 Since I'm always going on about what's happening outside my window, I thought you might want to see the view: the fire escape, the horse chestnut tree on the right, the brick wall and windows of another apartment building across the courtyard. If I get close to the window and look up and to the left, I can see the Empire State Building. I retrieved the colored glass ornament from my grandmother's house in Hyattsville, Md., after she died nearly 20 years ago. She actually got it in the 1930s in Cape Cod - it was made by a local artist from colored beach glass, all fused together with lead. It weighs a ton. Yesterday my friend Rob and I went up the Hudson Valley to Cold Spring and Beacon. We took the train from Grand Central and spent the day wandering through antique shops. I found a great postcard of the Williamsburg Bridge from 1903 that I bought for $4. We had lunch at a diner in Beacon called the Yankee Clipper, where they made a killer vanilla shake. I also had time on the train to read a bit of "The Berlin Stories" by Christopher Isherwood, which I've been reading for about two months now - I keep getting distracted, though I like the book. Consider this the beginning of a concerted effort to finish it! I had a great day yesterday! 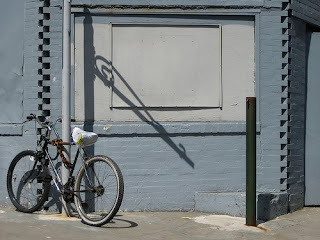 More walking, walking, walking - I wound all through Chelsea and down into the West Village and then wound up in SoHo. I took bazillions more pictures. Flickr is going to start charging me twice the normal fee! I just love getting out and exploring. 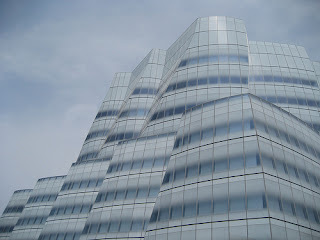 One of my goals was to go check out Frank Gehry's new building at 18th Street and the West Side Highway, a beautiful milky structure that rises up in a neat collection of curved planes and horizontal lines. It looked really nice against yesterday's pale sky. I know Gehry is all the rage in the architecture world - in fact, he might even be a bit overexposed - but his work really IS amazing and unique. 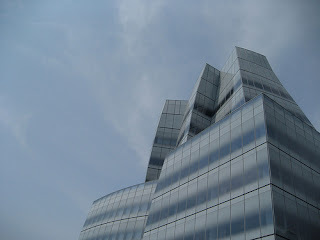 You can tell a Gehry building right away. Anyway, in between all this walking and photography I also got in a trip to the gym and a trip to the Zendo. And I bracketed the day with an interesting cinematic experience: In the morning I finished watching "Fahrenheit 451," which I'd started the night before, starring Julie Christie. (A bit tedious, but some interesting '60s style.) And then in the evening I saw Julie's most recent release, "Away From Her," a film about Alzheimers Disease that despite its subject matter never resorts to easy manipulation. Interesting to see the exceptional Julie Christie in two films in one day, at opposite ends of her career (thus far). And she still looks amazing! Yesterday as I was leaving the company cafeteria, carrying my cup of morning coffee, I rounded a corner and nearly ran into a man coming the other way. I had two reactions: Instant annoyance at his presence, and a need to define for myself why he was in the wrong place while I was in the right. It's not really important where we both were in the hallway - in fact, according to traffic rules, I was probably the one in the wrong place. What was interesting, to me anyway, was that dual reaction and how quickly it came. I think many New Yorkers live with a sort of perpetual low-level annoyance at people around them. There are just so many of us, crammed so close together, and we're always in each other's way. When I go to other cities I marvel at how spacious they feel compared to New York. The instinct to blame him was a surprise, at least to me. There was a reflexive close-mindedness to the idea that I could be in the wrong. What inner insecurity or defensiveness brought that on? And even if I felt I had to deflect fault myself, why didn't I think of it merely as the unhappy accident it almost was, the result of blamelessly shared trajectories? Of course, I didn't express any of these reactions - I just smiled and apologized. But how quickly our minds can classify and judge! I sat last night when I got home from work - opened the windows wide, put the cushion on the hardwood floor and let the sounds of the city wash over me. And what a racket - the birds! They weren't singing, exactly - more like peeping, cooing and squawking. There seemed to be a frenzy of evening activity, maybe a time for feeding and socializing before roosting for the night. And it all seemed to be happening in the horse chestnut tree outside my window. I heard doves, for sure, but I'm not sure what else I was hearing. Sparrows? Starlings? The sounds were more assertive and less musical than the morning songs I hear as I write (like now). When I sit I don't close my eyes - part of the practice is staying connected with the world, and after all you don't want to fall asleep. I was facing the window, but gazing downward toward the floor. Still, there was so much commotion outside that sometimes I just had to look up and see what was flapping around on the fire escape. And poor Armenia was beside herself with excitement. She sat on the window ledge, big-eyed, barely containing a plaintive meow every time a dove strayed near. Was it distracting? Well, sure. But sitting doesn't have to be silent. You just let the sounds become part of the experience, let them come and go, each squawk and coo passing with each breath. You don't hold onto them - which is what I was doing when I began thinking about which species I was hearing. Instead, you just let each sound pass so you can really hear the next one. I'm so lucky to have this apartment, with a tree outside and so much life in the courtyard. 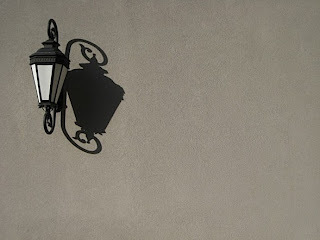 Before I began practicing Buddhism, I had an idea that being enlightened was a permanent state. Once enlightened, always enlightened. 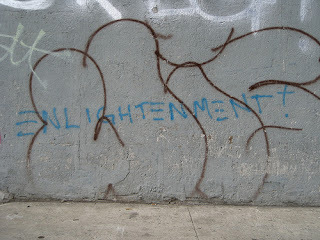 But since then, it's been explained to me that enlightenment - whatever it is - isn't permanent at all. (Just as all other states are also transient, from happiness to anger.) 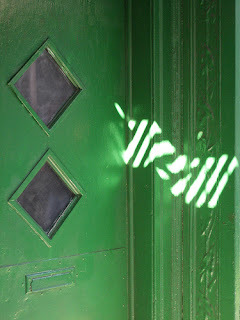 Enlightenment comes in flashes - for a brief second, maybe while meditating, a door opens and the light comes on. 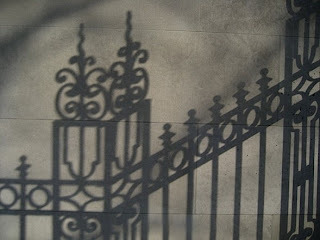 Then, though that feeling may leave you with a lasting impression, the door usually closes again. The trick, I suppose, is not clinging to that feeling of "I get it!" After all, if you're thinking "I get it," then your mind is occupied with thinking and you've already broken the spell of merely being. On another note, today is my blog's birthday! A whole year of blogging. 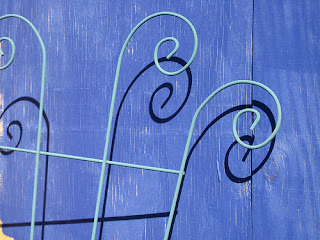 And how the blog has changed - it began merely as a place to show off photos, and now here I am, blabbing away. 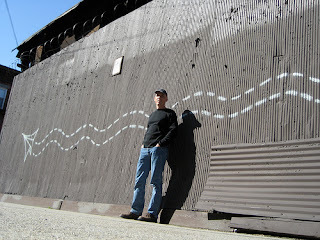 I told Pod yesterday that had I found Flickr before Blogger, I might never have started a blog. Funny how things work out! My brother wants to collaborate with me on a book. He thinks we should write about our childhoods, each from our own perspective, which would indeed be interesting because we're very different people and we remember such different things. But I'm not sure anyone would buy it! He advanced this idea because - in today's world of overscheduled, overprogrammed children - he thinks our childhoods were somewhat idyllic. We were latchkey kids, particularly him, and we had a huge degree of freedom after school to ride our bikes and crash around through the woods and just be kids. We were members of some groups, I the Boy Scouts and he the Little League, but mostly we kept ourselves amused. He believes we could illlustrate the value of imagination, why it's best to just let kids do their own thing. Plus we have some crazy episodes to recount. I'm not sure about this book from a commercial standpoint, but I'm actually already a step ahead of him. 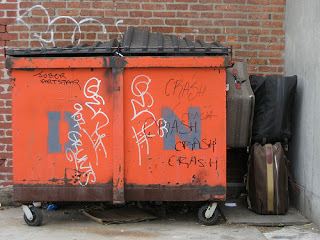 I've kept a journal nearly my whole life, and one day I began thinking about the inevitable baggage (photo above) contained in my daily journal. Journals tend to be pretty raw, filled as they are with unedited, immediate reactions to situations and people. I decided to write a public account of my life and then destroy my old journals. So I took step 1, but I never took step 2. (At least not yet.) I have a short memoir of sorts which I always figured I'd just pass on to my niece and whatever other descendants my family produces. So I told my brother, sure, I'll write a book with you, but we should do it for our family. If it turns out to have commercial possibilities, that's great - but we shouldn't count on that. We should do it for our own newer generations. I'm going to start by sending him what I've already written. We'll see! I finally got back to the Zendo last night, after having been away for more than a week. It was nice to sit again, though my mind was turning cartwheels - it felt a little hyped up, I suppose because I hadn't been sitting in several days. I think my schedule is finally lightening up. As summer settles in, after Memorial Day, it will get much more manageable. New York always gets slow during the summer, and the streets seem to empty out as everyone who can goes to Long Island or the Jersey Shore. I always just stay in town. I like the slower pace, the sultry days. Got another GREAT night's sleep last night. I think I've been sleep deprived without really knowing it! I walked, and walked, and walked. I have never walked so much in my life. The occasion was partly the AIDS Walk, as I mentioned, a 10-K walk that began yesterday morning in Central Park and took us through the Upper West Side and along the Hudson River. It turned out to be a beautiful day, after an initial bout of cloudiness, and the walkers were a powerful river of people surging all along the route. It's always kind of inspiring to see so many people turn out for a cause. This is the fifth year I've done the walk. The $1,250 I raised is a personal record for me, due largely to a couple of generous coworkers who gave hefty donations. I captained the team from the company where I work, which raised in excess of $4,000. The money goes to Gay Men's Health Crisis (which despite its name serves more than gay men) and other HIV and AIDS service groups in and around New York. Then, after the AIDS Walk, I just wasn't quite ready to go home. So I went to a diner on Madison Avenue for lunch and then kept walking. 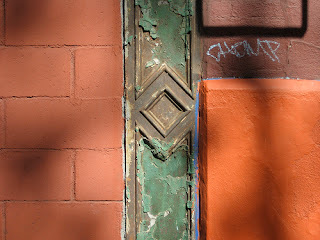 I decided to go uptown to East Harlem, a neighborhood I'd never explored much. Funny how I've lived here for seven years yet I'd never been above 96th Street on the East Side. I went up Madison Avenue and back to the west again, as far as Lenox Avenue in Harlem and as far north as 116th Street, and then east to Lexington. To make a long story short, I walked a heck of a lot, beneath an incredible blue sky. Took lots of photos. Explored new places. And when I came home at 4:30 p.m., I had a relaxing evening with the paper and went to bed early, thereby managing to get a solid eight hours of sleep. This morning, I feel great! Yesterday I went out to Queens to visit the "Maison Tropicale," a mid-century kit house designed by Jean Prouve for use by French colonials in Africa. It's on exhibit near the Queensboro Bridge prior to being auctioned by Christie's. 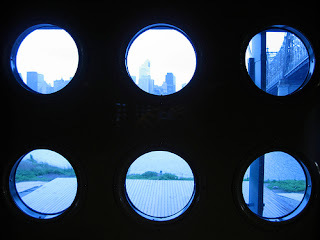 I've always liked mid-century design, and this is an interesting structure - a basic metal box with wood floors and these terrific little blue-glass porthole windows. I'm not sure how comfortable it would be in the heat of equatorial Africa, but it's visually pretty great. Apparently only a handful of them were ever made, and Christie's expects the house to fetch $4 million at auction on June 5. Anyone need a vacation house? Today is the AIDS Walk, for which I have been assembling a team of coworkers for the last several weeks. I wound up raising about $1,250, which made me pretty happy. More about that tomorrow! Whew! I'm having one of those crazy periods where I feel like I'm caught in a whirlpool, being spun around and pulled in every direction. Work was especially busy yesterday, I have a friend staying with me and my routines are utterly disrupted. I am just allowing myself to whirl along with all these forces, but I'll be glad when I get back into some calmer waters. I had Chinese food the other night, and my fortune said, "You will be proud in manner but tolerant and generous." I'm working on it! My employer is doing some housecleaning, and for three days has been holding silent auctions for employees to buy old wall art, outdated equipment and small items like ashtrays and corporate china. Yesterday, as I was checking out the auction, I found a terrific framed black-and-white photo of some kids playing on a sculpture with the twin towers of the World Trade Center in the distant background. I liked the juxtaposition of the happy kids with the sad image of the WTC. So I bid on it. As the auction wound down a few hours later, I went to watch the final moments and to make sure no one outbid me. As it turned out, I and two women were hovering over this photo. One of the women bid; I bid against her. She picked up the pen again and wrote her name, then stood there as the last minutes ticked by. She waited and waited, apparently thinking. It was obviously a strategic ploy to delay so she could pop in her bid at the last minute, blocking us from acting further. The second woman got annoyed. She demanded that the first enter a bid. The first woman remained silent, contemplating the picture. "I can't believe this," the second woman said, glaring at me. I decided right then and there that I was going to remove myself from this battle. I did not want this picture badly enough to alienate people I would later encounter in the workplace. The first woman wrote her bid just as the bell rang. The second woman threw down her pen and sternly reprimanded the first woman for playing dirty pool. She stalked away. I smiled and congratulated the first woman. As it turned out, she bid $65, which was more than I would have paid anyway. Auctions really are terrible things. Everyone gets so tense. And in the workplace they're especially dangerous. I hope that second woman never needs a favor from the first, or vice versa! 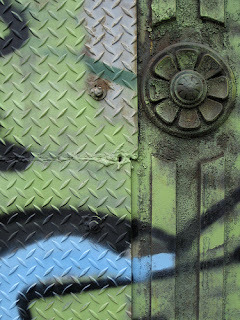 For me, one of the main appeals of street art is its transience. 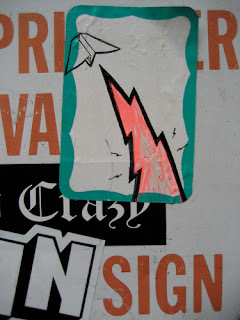 I like the art even more when it's been outside for a while, and it's weathered and faded and maybe even torn - like this sticker by Bloke, who you may remember specializes in art of paper airplanes. The Japanese have an aesthetic concept called wabi-sabi which basically appreciates the beauty of imperfection. Bloke's sticker embodies this aesthetic, I think. People are likewise beautiful in their imperfection. As one of my fellow Zen students said in a talk recently, how boring we would be if we were all perfect little automatons. Instead we've suffered our own weathering, our torn and frayed edges, and those make us more interesting. Which is my long way of saying I wish I'd been more temperate in my post yesterday about Jerry Falwell. I'm not really happy that the man died. Instead, I feel more like a kid who's been bullied for a long time and suddenly awakens to find the bully has moved away. And I don't think Falwell meant to be a bully - I don't think he entirely understood how hurtful he was being. I actually wrestled with taking down yesterday's post entirely. But I decided to leave it up, even though I felt it was a little extreme. After all, I'm just as imperfect as Jerry Falwell was. When I heard yesterday that Jerry Falwell had died, I was happy. And relieved. I wish I were big enough to mourn the loss of Falwell as a human being, an element of humanity as a whole. I’m sure his relatives and friends are saddened by his death, and I’m sorry for their sadness. I know that his moralizing and bigotry stemmed from his genuine, though misguided, interest in protecting his values and those of the country. But the fact is, Jerry Falwell was a man who misused religion. He gave lip service to loving the sinner but his statements - like the assertion that 9/11 occurred because God was angry at America over gays and abortion providers - created a climate that allowed discrimination and violence to flourish. It’s interesting that I’m ready to forgive Anita Bryant - who came from pretty much the same place as Falwell, ideologically - but I’m not quite ready to forgive Falwell. I think it’s because Bryant earned a measure of affection from me as a child, whereas I’ve only known Falwell as the heavy-handed leader of the Moral Majority. So, yes, I felt relief at his death, relief that this thorn in the side of American society had finally come out. 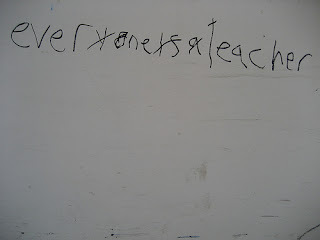 I like this sentiment, though it's not always easy to see at the time you're being taught! I'm wondering what I'm being taught as I sit here in the quiet morning, typing, and my next-door neighbor is sneezing and hacking so powerfully that I can hear him through the walls. Poor guy. He must have one heck of a cold. Maybe it's a lesson in compassion. Rather than be annoyed at the noise, and the fact that he's drowning out the mourning doves, I have to keep in mind that he's apparently sick. My plumber last week was a great teacher, too: That was definitely all about compassion and patience. And what am I teaching each day when I go out into the world? I did contact four or five guys, and one of them responded. We went out a couple of times but there was no chemistry to speak of, and in fact after a while I found him a little annoying. Neither of us called the other back. So that was that. When it comes right down to it, I'm pretty happy just being single. This has always been my natural state - lots of friends, busy social life, but little or no dating. Fighting that just seems a bit forced. So no more Match. I prefer to remain open to possibility while cultivating my own solo happiness. And I can think of better things to do with 40 bucks a month! South Street is down near the financial district, and used to be lined with fish markets and seafood suppliers. Many of those businesses have since moved on, and like everywhere else, South Street has become gentrified into a shopping mall. But it still offers occasional picturesque views. After all, our security is a myth. Change will come whether we want it or not, and in fact, will ultimately take everything from us. How we deal with it is the real issue. Fighting it is useless and leads only to unhappiness. So we take a deep breath, follow that breath, and proceed on with a level head. My blog pal Reya said it beautifully in her comments: "Nothing in this precious existence we're living is guaranteed. Change is everything, yet we humans resist that reality with all our might. We're so funny." When I took this photo I thought it was funny - Buddhist humor, more or less. But when I look at it this morning, it seems more serious. That's probably because I'm feeling a lot of uncertainty myself. We got word yesterday at work that my employer's recent financial picture hasn't been all that great. Revenues have been down, and cost-cutting hasn't saved enough money. So the specter of deeper cuts is looming. No one's said anything about layoffs, at least not yet. But still, I worry about my future. I've worked for this particular company in a number of different jobs ever since I graduated from college in 1988. I've never really had to go out and look for a job from scratch. I wouldn't want to have to start now. On a deeper level, I'm worried about my whole industry. Journalism has changed so much with the advent of the Internet and the conviction among many people that news should be free. No one wants to pay for a newspaper anymore, and newspapers haven't figured out how to make money from their Web sites. Sometimes I think this is all just a process of painful adaptation; sometimes, I think it's a death spiral. I can't worry too much about it. There's nothing I can do, aside from doing the best job I can at the position I fill. Maybe nothing will happen. Maybe I'll get laid off and the change will be wonderful. Maybe I'll wind up sleeping in a shelter. The point is, the variables are too great to know, and worrying about an unknowable thing isn't very productive. Still, I can't help but worry a little. I can't believe how fast the seasons change. Just a week or so ago it seems I was luxuriating in the shadow of clouds of pink cherry blossoms, and the leaves on the horse chestnut outside my window were new little flags of pale green. Now the trees have shed their blossoms, which piled up on the ground like pink snowdrifts, and the horse chestnut is a dark, heavy "Curtain of Green," to borrow a title from a Eudora Welty story. We recently had a few bursts of cool temperatures, but I think we might finally be done with jacket weather. We're poised at just the right spot on the thermometer, when I can walk to work in shirtsleeves and not be too hot or too cold. And just now, as I lay in bed typing with my coffee and my cat next to me, we heard the rumbles of summery thunder amid a downpour that obscured my view of the Empire State Building and left the leaves of the horse chestnut dripping. The perfect balance, as spring moves into summer! 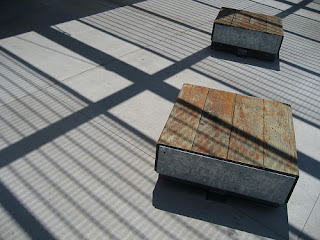 These benches, covered by a geometric awning, are in front of the ferry terminal on Staten Island. I think my biological clock or my circadian rhythms or whatever are changing. For years, I've gone to bed at 10 p.m. and gotten up at 6 a.m. And when I say years, I mean two decades. A long time. But just within the last year or so, I've been staying up later and getting up earlier. Last night, for example, I was up until 11:30 and this morning I got up about 5:30, which is not really what I would call a full night's sleep. That seems to be more my rhythm these days, though. I know as we get older we need less sleep, but it's a little disconcerting. I picture my little cells, rebuilding and replenishing themselves, and wonder whether they're doing it less. What functions is my body giving up to allow these later hours? Also, I do get tired during the day, particularly after lunch. I think I am suffering a bit of deprivation. It may just be a matter of getting myself to bed, and not letting daily distractions trump my need for sleep. I have to just lie down and turn out the lights. As they say in the Nike commercials, Just Do It! As I write this, there’s a plumber under my sink, wrestling with the installation of a recalcitrant faucet. I am wrestling myself, with a variety of mixed emotions. I had a 9 a.m. appointment with the plumbers to install this new faucet. This morning, I made sure to be home from the gym well in advance of 9 a.m., though I was prepared for them to be late. I figured all repairmen show up late, so this would be no different. And indeed, by 9:30, no one had shown up and no one had called. So I called to verify that I was on the schedule, and the dispatcher said they’d had an emergency call but assured me that the plumber would be here by 10:30. The hours ticked by. At 11:30, I called again, and they assured me he’d be here within half an hour. I got the same assurance when I called at 1:30. By 2:30, my boss was calling, wondering what was taking so long. Surprisingly, I wasn’t really angry about being put off this way. I wasn’t sure how to feel. On one hand, I wanted to practice my Buddhist patience and compassion, realizing that in all likelihood the plumbers were trying as hard as they could to meet their schedule as well as the demands of their emergency customer. On the other hand, I didn’t want to be a patsy. What frustrated me more than the plumbers being late was that I couldn’t get an answer about what was happening and when I could expect them. I sat for a while, trying to breathe into my impatience, my annoyance, my puzzlement at what to do. Finally I called the plumbers’ office and pointed out that I am president of my co-op board, and that although our managing agent had recommended them, if they didn’t get someone to my apartment within half an hour I would make sure the managers never hired them again for a job in our building. Within about 20 minutes, they showed up. In fact, almost comically, two crews showed up. Apparently the dispatcher, sensing my desperation, sent a backup. But wait - there's more. The plumbers conferred and decided they had to go out and get a faucet. I waited another 45 minutes while they navigated the traffic of Manhattan to some unknown supplier, even though there’s a hardware store literally across the street. And even though I told them yesterday, when I made the appointment, that I needed a faucet and was assured they would bring one. Now, I am simply staying out of their way. I am trying to be pleasant. Trying to be patient. Trying to be compassionate. But also trying to stick up for myself. Epilogue: Well, the good news is, the faucet looks great and seems to work beautifully. The bill is still an unknown. They said they would send me an invoice. I’ve already decided that I’ll pay for the time they were actually here in my apartment, as well as supplies, but not for their 45-minute jaunt across town to buy a faucet (since they should have had one already). Get ready for round two! 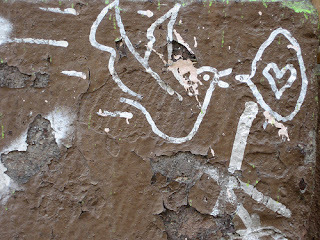 It's funny that I've just been writing about both bird-watching and my enthusiasm for street art, because it occurred to me yesterday that they're really very similar. Bird-watchers (or "birders," as they prefer to be known) collect sightings of birds, making lists of what they've seen and where. 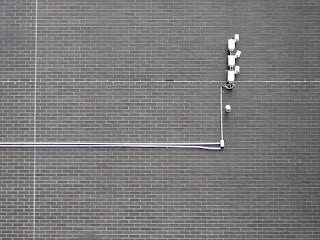 And I'm doing exactly the same thing when I wander around town collecting street art photos, and cataloguing them on Flickr. 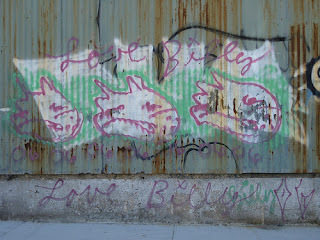 Sometimes street art even appears in flocks, like these dogs by Love Billy. Today the plumber comes to fix my faucet. I hope it doesn't cost a million dollars. I had a glorious day yesterday! The weather was nearly perfect - a little on the cool side, but sunny and brilliantly clear. It was a great day for walking. 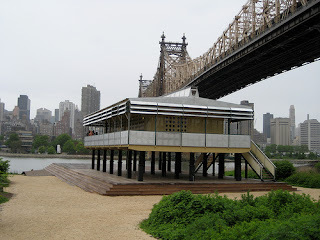 So after going to the Zendo in the morning, I went out with plans to walk over the Williamsburg Bridge to Brooklyn. 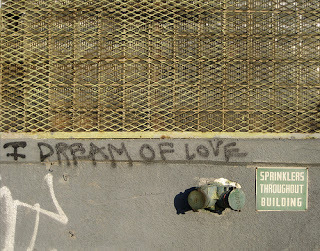 I did that walk last fall and got tons of great photos of street art on the bridge, so I thought it was time to check out the scene once again. Oddly, the bridge was not as productive this time, though the view of the city from high over the East River was well worth the trek. 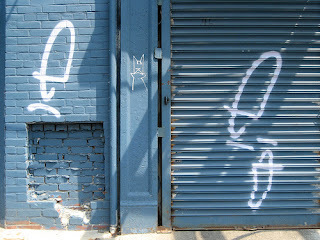 But I did get more photos both on the Lower East Side and then in Williamsburg. In fact, I came back with about 80 pictures, and that was after being painfully selective. I think I initially took about twice that. 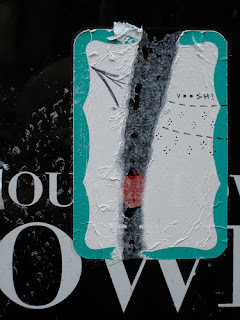 My current fave is the artist who did the work above. He goes by the name of Bloke (so I assume he's a he!) and his specialty is paper airplanes. You find them on stickers and on huge walls, tiny ones and big ones, all flying and soaring and zooming with a variety of jet trails in their wake. They're so fun and they seem so positive, evoking thoughts of flight and childhood games. Here I am with one of Bloke's larger creations. I set the self-timer on the camera and propped it up on my backpack, which is why it's at kind of a weird angle. I've really had a ball the last few weeks adding to my collection of street art photos and learning more about the artists and their identities. The collecting impulse is interesting. I do feel like I "have" something when I take a photo of a good piece, although the ownership is certainly an illusion (as almost any ownership is). I particularly like taking photos of the little stickers that probably aren't long for this world, preserving them and putting them up on Flickr to share. And what amazing exercise - I walked for about four solid hours yesterday! I was feeling adventurous yesterday, so I got myself down to the Staten Island Ferry and went across New York Harbor to Staten Island, which I've only done one other time in my life. It's not that far and it's certainly not difficult - and the ferry is free - so I don't know why I don't get out there more often. It doesn't even feel like New York City. It feels more like New Jersey. 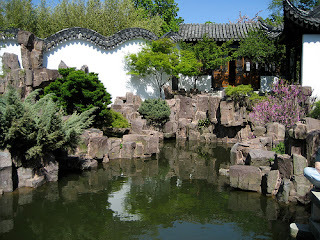 One of the chief cultural attractions on Staten Island is the Chinese Scholar's Garden at the Staten Island Botanical Garden. Some friends from the Zendo who live on Staten Island picked me up at the ferry and we went there for the afternoon. It's modeled on classical Chinese walled gardens where upper-class scholars and bureaucrats found sanctuary from the worries of the world. 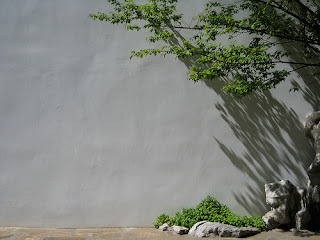 The garden employs elements like a round moon gate and open-grille windows that catch light and create ornate shadows. 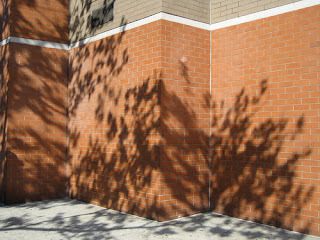 The white walls also set off the shadows from the leaves and branches of the maples and other trees. The garden unfolds in a series of passages and courtyards with carefully controlled views and plantings. 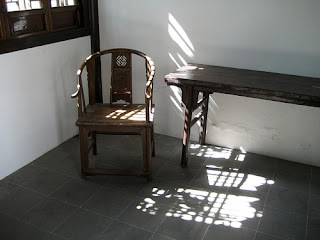 Some of the rooms include furniture, supposedly antique from 19th century China. (Having been to Chinatown, I'm skeptical of anything that says it's a Chinese antique!) Overall, the garden was quite beautiful, though I was left with the sense that the Botanical Garden is struggling a little with maintenance. 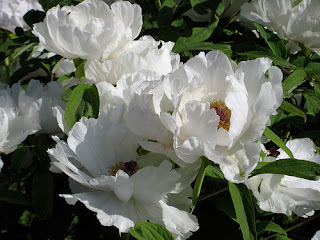 It was also peony time, so we got a chance to see some in bloom. 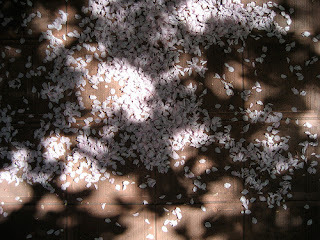 They smell almost like roses, and the single ones have beautiful papery petals. 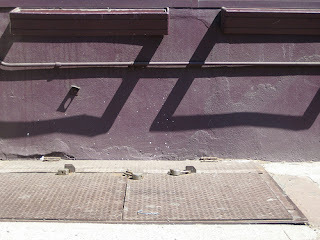 Division Street is an interesting, diagonal street on the Lower East Side. I suppose at some point it must have divided something from something else, but now it's just full of Chinese businesses and colorful graffiti. Had a minor home-repair emergency last night. The faucet in my kitchen, which has always been a little dodgy, suddenly decided to stop working entirely. So I who know nothing about plumbing got the bright idea to try to repair it myself. I got out my wrench and began unscrewing the top, which resulted in a slow leak around the base. Then I found that I couldn't shut off the water - no matter which direction I turned the valves under the sink, it kept flowing. And then I couldn't get the faucet tightened again to stop the leak. I called my super, who wasn't answering his phone. I called the management company and left a message with their answering service. And I called a plumber, who informed me it would cost $180 AN HOUR to get someone to come out on a Friday night. I called my brother. I called my mother. Finally the super called me back and he managed to get the faucet tightened enough to stop the leak. It still doesn't work, but at least my apartment isn't going to flood. Looks like I have a date with the plumber next week. As I sit here typing, a bird is chirping away outside my window. How different our modes of communication are! I type, he sings. Growing up in Florida, I never paid much attention to birds. I knew the basics, like mockingbirds and robins, but I always thought our neighborhood was devoid of anything more interesting. Then my mom got into birdwatching, and now we take walks and see bluebirds and catbirds and cedar waxwings and perula warblers. They must have been there all the time, and I just never looked. Once we went to Fort DeSoto State Park, which is at the southern tip of Pinellas County at the entrance to Tampa Bay. It's a stopover point on the migration routes, and I saw the most psychedelically colorful birds there. The ones that really stand out in my memory are indigo buntings, which are unbelievably blue, and scarlet and summer tanagers, brilliant orange and yellow. Who knew birds could be so amazing? In terms of song, it's still hard to beat a mockingbird. They're comical in their skill and enthusiasm. You can't help but laugh at their cascade of sounds. When I first started this blog I was worried the photos would take up too much space on the server. So I made them very small. Today, as I was uploading this photo, the uploader told me I had so far used 17MB, or 1 percent, of my allotted photo space. That's after nearly a year of blogging! Guess I didn't need to be so concerned, right? Another example of my mind creating its own problems. This photo is truly about celebrating the ordinary. That little red plastic bottle cap just seemed to jump out at me as I walked past. 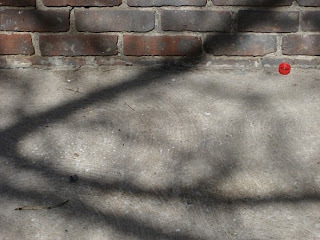 I thought it looked pretty nice lying there against that brick wall. 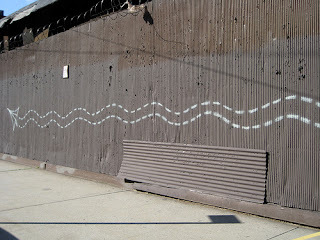 The ghost of Joan Miro apparently surfaced on the Lower East Side long enough to paint this wall, which even comes with its own frame. I quite like it. Several weeks ago I agreed to write an article for the Zendo newsletter about my trip to Botswana last summer. I was a little concerned about it, because I wasn't sure how well I'd be able to relate Africa to Zen practice. But as it turned out, when I sat down and finally put my mind to it, it all came together pretty well. (It's a good thing that ultimately everything is practice, right?) When it comes out in the newsletter I'll share the link with you. Meanwhile, my friend Jesse posted a photo of me taking photos. I think I need a shave. It's very hard to type when you're lying in bed with a cup of coffee at your side and a cat on your chest. My Zen teacher gave a talk on Sunday that at one point touched on the notion of "small desire." To have small desire is an esteemed trait in Buddhism, and the Zen master Dogen wrote in his interpretation of the Buddha's teachings that it's one of the "Eight Awarenesses" to be cultivated by Bodhisattvas. My teacher quoted from Dogen's essay on this topic, and I wish I had the exact quote because it was really beautiful. "Small desire" is not about being lazy or indifferent - in fact, Diligence is another of Dogen's Eight Awarenesses, and diligent practice is not for the lazy. Instead, it's about craving less, learning to quiet the inner hunger that drives us all to endlessly consume. It's funny how, in American culture and probably in much of Western culture, having "small desire" is a thing to be mocked. If you don't have ambition and drive you're a slacker; if you don't want to get ahead and keep up with the Joneses you're somehow less of a person. If you're not a recreational shopper your coworkers don't understand you. Your family thinks you're odd if you don't want presents at Christmas. If you have a job that meets your needs and you settle into that job, to keep it too long is considered a deficiency, a blight on your resume. And yet, "small desire" is such a beautiful, freeing concept. Think of it: The realization that we have all we need. It's all right here. There's no need to be hungry. We are complete, and living life in our completeness. I've been working a lot with "small desire" over the years. Fortunately, I've never been an extremely ambitious person, so to have "BIG DESIRE" is not my nature. I have gradually been whittling down my life and realizing how little I really need. When I came back from the Peace Corps in 1994, I owned rooms full of furniture and possessions that I had in storage at my Mom's house. I moved it all into a two-bedroom, two-bath apartment, and as I was unpacking it -- I who had recently lived in a single-room mud-and-stone hut -- I thought, "WHY do I own all this?" Ever since then, I've been gradually giving it away. I'm down now to a studio apartment, and a pretty spare one at that. I love the openness and emptiness of my space, and I often wonder how far this dispersal will go. I keep pushing the limits, taking another box or two to the Housing Works thrift shop, and with every box I get rid of I feel lighter. 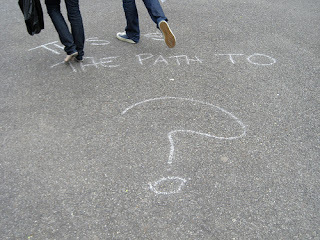 I go through moments when I desire a new job, or desire a date, but honestly, those desires aren't very strong, which is why I don't work very intently on finding either one. Really all I desire is a chance to sit out in the sun and pet my cat and watch the sky, to walk around this city that I love, and to practice.